It goes without saying that summer has taken the UK by storm this year, with large parts of the country enjoying some of the best weather for over 40 years. But just as we had acclimatized to daily temperatures in excess of 30Cs, the mercury is set to increase even higher this week as record-breaking temperatures from Spain and Portugal heads our way. Sweltering temperatures pushing past 40C + have recently hit these popular beach holiday resorts, with red flags waving as the heat travels northward. Temperatures in London today are expected to reach 29C, with forecasts looking to rise to 36C by Friday. If you like a touch of R&R while on holiday (who doesn't? ), one of the best ways to live the life of luxury - for less - is by going all inclusive. With beachfront hotels just steps from the sea, splash-tastic infinity pools, palm-shaded terraces and unlimited drinks on offer - guests can escape the heat as often as they please. 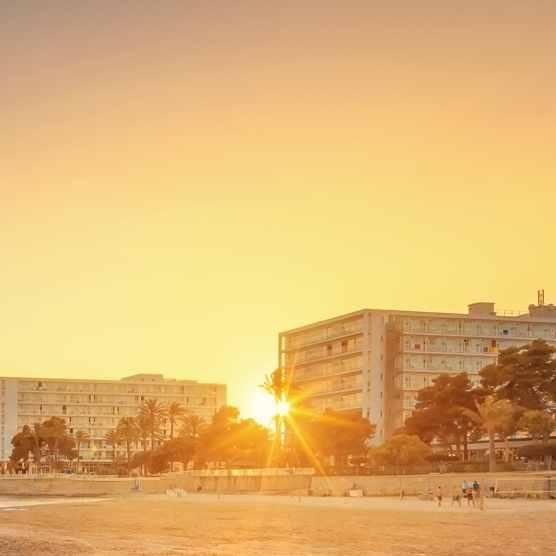 Browse our selection of all inclusive hotels for a holiday that has it all, better still, everything from flight tickets, accommodation, food and drink, plus entertainment is paid for upfront - meaning you can stock up on ALL the refreshing ice lollies without worrying about your wallet. You'll find some of the best waterparks in Europe dotted around these two destinations, and what better way to cool down than a splash-tastic day out that excites the whole family? If you're staying in the Algarve, ZooMarine and Aquashow Park are among the best for entertainment, with a medley of thrilling slides, flumes, shows and lazy rivers to leisurely float down. Located near Costa Adeje, in Tenerife, Siam Park is Spain's most iconic water park, this Thai-themed metropolis is brimming with adrenalin slides, oversized shark tanks, killer 'coasters, live shows, restaurants and more. Portaventura Caribe Aquatic Park is a close second (located next to sister park Partaventure Park), with a balmy Bahama Beach to lounge on when you need a 5-minute break from the flumes. While boat trips and sightseeing tours are high on the excursion list, there's a whole realm of tourist attractions worth heading to where you can escape the sun and soak up the local culture. Museums, shopping malls, grand cathederals and pincho parlours are just a few ways you can cool down while exploring more of the country. Lounging on the beach is a summer holiday pastime, but with weather forecast's due to reach dangerous high's this week, it's best to steer clear of the sands in the midday heat. Whether you book in a sumptuous spa treatment at your all inclusive hotel, or spend the day flitting to and from your villa pool, it's best to wait until the sun starts to set before heading out of your hotel suite. Wandering the bustling beachfront promednades is a nice way to start the evening, before dining in a waterfront restaurant overlooking the harbour. If you're a party lover, make up for the hours you missed out on during the day after dark, when the resort towns spring into action!